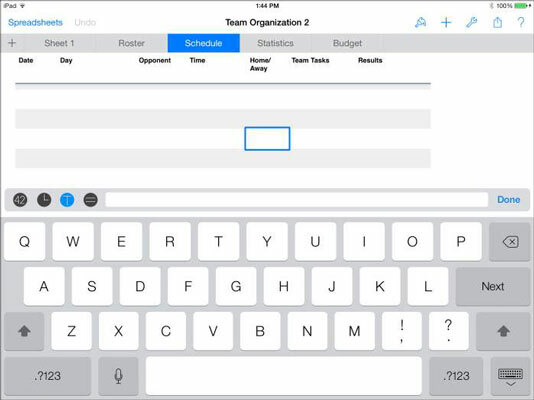 It is easy to add and edit data in Numbers for iPad. You double-tap a cell. A blue outline appears around the cell, and the keyboard appears so that you can begin entering data. Single-tap if you want to select a cell. The cell is outlined, and the table-selection elements (the column and row frames, the Cells button, the round button to the left of the column frame, and the button to the right of the column frame as well as the button beneath the row frame) appear. A double-tap makes the cell available for editing. This figure shows how, after a double-tap in a cell, the keyboard appears. After you set up your spreadsheet, most of your work consists of entering and editing data of all types. 42: The first button lets you use the numeric keyboard. Clock: The second button lets you enter dates and times. Text: The letter T displays the standard text keyboard. Formulas: The equal sign (=) opens the formula-editing keyboard. Whichever keyboard you’re using, you see the characters you’re typing in the Formula bar above the keyboard. To the right of the oblong area is a button labeled Done (or a check mark, depending on which keyboard you’re using) that moves your typing into the selected cell and then hides the keyboard. The Dictation feature on iPad (not available on the iPad 2) works in Numbers and the other iWork apps. Tap the Dictation key on the onscreen keyboard and speak your text; tap the key again to insert the text in your document. You can bring up the keyboard when you double-tap a cell or another text field (such as a tab name). That means the cell is selected and that the keyboard knows where the data should go when you tap OK or Done. Note that many of these features are unavailable on a Bluetooth keyboard, which may or may not have a number pad and special symbols used in entering formulas. Delete: This is the standard keyboard Delete key. Next (adjacent): The Next key with the right-pointing arrow inserts the typed data into the selected cell and moves to the next cell to the right. Next (next line): The Next key with the hooked arrow pointing left and up inserts the typed data and moves to the next line and to the leftmost cell in the section of cells you’re entering. For example, if you start in the third column of the fourth row, the Next (next line) key moves you to the third column of the fifth row, not the first column.